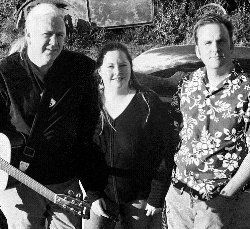 The names Jenni Jamison and Ed Priest may comprise the name of this group, but all four members are poets. In fact, their CD is titled “WE CALLED OURSELVES POETS.” Add harmony blends and great acoustic music and all of a sudden, they’re songwriters. Penning most of the cuts, Jamison and Priest become simply JamisonPriest, and include a few covers on this outstanding sixteen-cut release. Songs of love, life, and inspiration make this an easy listen and a refreshing addition to your Texas music collection. A favorite is the matter-of-fact “Independent” which captures Priest’s writing talent and showcases his voice with Jamison’s harmony. Cole Bennet chimes in on lead vocals on the Michael Burton classic “Night Rider’s Lament” which accents JamisonPriest’s three-part harmonies on a true cowboy treasure. The fading harmonic yodel is worth the entire purchase. Add Mark Pruitt and you’ve got four vocalists who can make the music come alive. This disc is a folk-acoustic-vocal treasure. Get the disc today for only $13.99! my Genre: Folk Spiritual my Reviews: 3 Read Em! Add a review!